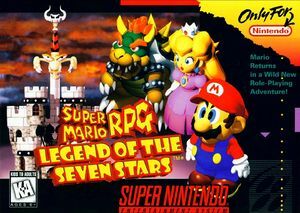 Super Mario RPG: Legend of the Seven Stars, known in Japan as Super Mario RPG (スーパーマリオRPG Sūpā Mario Āru Pī Jī), is an action role-playing game developed by Square and published by Nintendo for the Super Nintendo Entertainment System. Square did much of the development of Super Mario RPG under direct guidance from producer Shigeru Miyamoto. It is the first role-playing video game in the Mario franchise, with token similarities to other Square role-playing video games but with a story and action-based gameplay derived from the Super Mario Bros. series. The graph below charts the compatibility with Super Mario RPG: Legend of the Seven Stars since Dolphin's 2.0 release, listing revisions only where a compatibility change occurred.